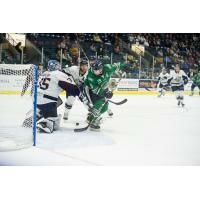 ESTERO, Fla. - The Florida Everblades scored three times in the third period to overcome a one-goal deficit and earn a 3-2 win over the Jacksonville Icemen on Wednesday night at Hertz Arena. With first place in the South Division on the line, Florida (12-5-4-0, 28 pts.) did all its scoring in the third period to beat Jacksonville (13-8-1-0, 27 pts.) for the fourth time in six meetings this season and stretch its point streak to nine games (7-0-2-0). Trailing 1-0 almost seven minutes into the third period, the 'Blades finally solved Jacksonville goaltender Ken Appleby on their 42nd shot of the game. Zach Nastasiuk was the recipient of a one-handed pass from Blake Winiecki, who shoveled the puck to Nastasiuk at the side of the net. Upon receiving the pass, Nastasiuk held onto the puck just long enough for Appleby to bite and then flipped it over the spread-out body of Appleby for the goal to tie it at the 6:48 mark of the final period. Joe Cox gave the Everblades their first lead of the game with 7:17 to play in the game. Michael Neville sent a pass to Logan Roe at the left point, and he teed up a shot that kicked off the pads of Appleby. The puck went straight to Cox, who was waiting alone to the left of the crease. Cox took the puck and ripped a shot over Appleby to give the 'Blades a 2-1 lead. Florida goaltender Jeremy Helvig came up with a huge flurry of saves on Jacksonville's Colton Veloso with 4:14 to play, keeping three straight shots from Veloso's stick out of the net to preserve Florida's edge. The 'Blades didn't have to beat Appleby for their third goal of the game, the eventual game-winning tally. The Icemen pulled Appleby with over three minutes to play, and Nathan Perkovich picked off a pass in the middle of the ice and sent it to the back of the empty net to make it 3-1 with 2:55 left in the game. With 2:40 to play and the Jacksonville net empty again, Wacey Rabbit pulled the puck from a pile in the left faceoff circle and beat Helvig with a backhand shot from just to the right of the crease to make it 3-2. Again, the Icemen pulled their goaltender and made a push down the stretch to tie the game. But Helvig came up with a gigantic save for the 'Blades with 45.6 to play, diving backward to cover up the puck in the midst of a net-mouth scramble to preserve the win. The Icemen took the 1-0 lead at the 3:34 mark of the second period on Max Fortier's fifth goal of the season. Helvig improved his record to 4-3-3-0, stopping 16 of 18 shots in the win, while Appleby made 45 saves on 47 shots in the loss. Florida continues its six-game homestand with a 7:30 p.m. matchup against the Greenville Swamp Rabbits on Friday. Fans can score on $2 End Zone tickets by showing a Wendy's Frosty Key Tag at the Florida Community Bank Box Office.